Silver pendants are the most versatile piece of jewellery. Whether you love ethnic pendants, or designer silver pendants, getting dressed for work or an evening out has never been easier! All Ahilya pendants are made with Sterling Silver that may be gold plated and embellished with precious and semi-precious stones like turquoise and mother of pearl. 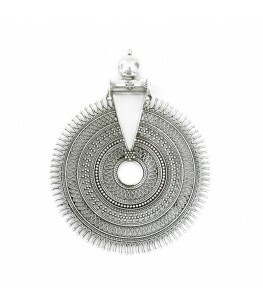 We love oxidized tribal pieces with an antique finish. With one of the most unique collection of pendants with everything from beautiful and classic Mother of Pearl pendants, to beautifully hand-carved filigree pendants. Whether it’s the latest designs, or re-working antique designs to suit newer sensibilities, we have got it all. Our unique designs span across various collections and suit every occasion. The Imperial Filigree Collection has influences from the east with beautiful and intricate cutwork pendants, while our Dakshin Collection has influences from the south, with Temple pieces reimagined in modern designs. We are especially fond of mother of pearl jewellery and the Pearlescent Collection is an ode to that. We also have a Statement Collection that includes Designer pieces with tribal etchings, vintage designs, and contemporary structures. 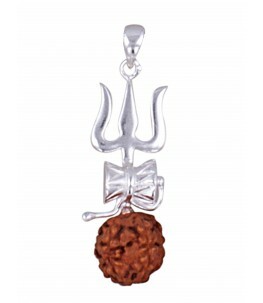 Statement Silver Pendants – Our gold plated silver pendants are Temple inspired. Beautifully engraved and embedded with semi-precious stones, these are lovely to wear as is, or paired with other statement pieces. Silver pendants on corded necklaces – Silver pendants on black cord are absolutely versatile and look great with everything. Whether they are beautifully engraved silver beads strung on a black cord, or lovely rawa work pendants strung on a thick black cord, these silver pendants look absolutely spectacular. Mother of pearl pendants – We have a lovely Mother of Pearl collection with unique silver mother of pearl pendants. Strung on simple sterling silver chains, these pendants look classy and elegant and are great for evening wear. Silver Filigree Pendants – Ahilya has a huge variety of unique filigree designs and its silver filigree pendants are lightweight and lovely. With intricate cutwork designs which are purely handcrafted, these beautiful silver pendants come in silver, yellow gold plating as well as rose gold plating. These designer silver pendants are great to wear with everything. Taweez/ Taveez Pendants – A taweez has been historically worn to ward away evil energy and bring good luck. Our Silver Taweez Pendants are eye-catching and will bring you all the good energy you need. Our silver Taweez Pendants have beautiful semi-precious stones engraved on them – moonstone, mother of pearl, turquoise etc., and can be opened from one side to reveal a secret little compartment. These are great gifting options!